If you thought President Obama was going to change the way George W. Bush was running the country when he was elected, you would be mistaken. Candidate Obama even thought it important enough to tell voters at a speech in Powder Springs, Georgia in 2008 how important it is for their children to learn to speak Spanish. But he didn’t explain why it’s important. “Instead of worrying about whether immigrants can learn English — they’ll learn English — you need to make sure your child can speak Spanish, …You should be thinking about how can your child become bilingual. We should have every child speaking more than one language.” More later on why Obama really wants Americans to speak Spanish. After Bill Clinton sold out to corporate America with NAFTA, the North American Free Trade Agreement in 1994, the economy and politics have been dictated by the CEOs of Canada, Mexico and the United States to their leaders. Clinton selling out to corporations was the first step toward the integration of North America. 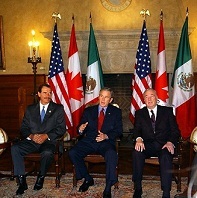 The leaders of Canada, Mexico and the United States then decided to merge the three nations into a trading region, following in the steps of the European Union. 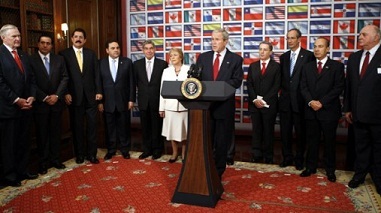 Obama has already announced the two final steps for continental integration, possible only because George W. Bush met with the two leaders of Canada and Mexico in Waco, Texas and signed the agreement of the Security and Prosperity Partnership of North America (SPPNA) on March 23, 2005. Bush denied signing the agreement but shortly after the agreement was signed, the Council on Foreign Relations plan for building a North American Community was being implemented and is currently the case as CEOs from all three countries “advise” their leaders and their ministers. This is the road map to Building a North American Community, put together by CEOs from the three nations. The initial signing agreement was verified by then Canadian Prime Minister Martin, other officials and noted on page 24 of the road map. It was at the White House that Bush began the breakup of America and later, President elect Obama jumped on board the integration of North America with a Bush briefing before leaving office in 2008. There, Obama also agreed to keep NAFTA intact, breaking his campaign promise to make changes to protect the environment and protect labor. He did neither. Instead, he signed three more trade agreements with South Korea, Panama, and Columbia. The agreements were approved of by the U.S. Chamber of Commerce. And at that White House meeting Obama did more and promised to finish building the North American Community plus finish the Bush plan for integration of the 34 nations of the Americas. The Partnership for Prosperity in the Americas (PPA) is a plan that George H.W. Bush had unsuccessfully (FTAA) tried to finish. It was to be based on the model of the European Union. Obama has promised George W. Bush that he would finish the project. All 34 nations would be subject to the trade agreements and these agreements would trump all constitutions wherever applicable. Also, regional organizations and international law would supersede our constitution. This would, of course, destroy significant parts of our U.S. Constitution. 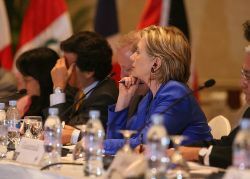 The Americas plan (PPA) was welcomed by President Obama and Secretary of State Hillary Clinton. This integration of 34 nations would allow the United States access to nearly a billion more cheap workers in this huge trade agreement. Yes. It means cheap labor competing with Americans. It means massive unemployment and poverty over the next 40 years for Americans. In case you didn’t know, our leaders and their masters, the CEOs, have been together on this goal seriously over the last two decades. If Americans do nothing now, the future will be a never ending nightmare as the U.S. literally breaks apart. And no police state will be able to stop it. The Secretary of State is in charge of the integration of North America and the Partnership for Prosperity in the Americas. She is also one of the ministers of the North American Community. The former Secretary of State Clinton and the other two ministers take legislation and regulations from CEOs and sends them to members of Congress for action. The other two ministers are the Secretaries of Homeland Security and Commerce. Yes. the unelected heads of companies, such as Whirlpool and Ford, are making legislation, bypassing Congress. The same situation is taking place in Canada and Mexico. Members (CEOs) of the former NACC, North American Competitiveness Council, meet with their counterparts from Canada and Mexico. The NACC is still active but no longer refers to that title. This group, however, is still running the show and meets with the leaders of North America at their annual summit. 1. She means that the Americas will become one region, governed as one by the 34 nation trade agreement, appointed regional agencies and institutions, and international law, which includes a new definition of free speech. And guns will be banned for all citizens. That is why USNORTHCOM and USSOUTHCOM have been divided up into comprehensive security forces and why American soldiers are being trained to deal with regional “civil unrest” and to combat against American citizens opposed to the end of our republic and the 2nd amendment. 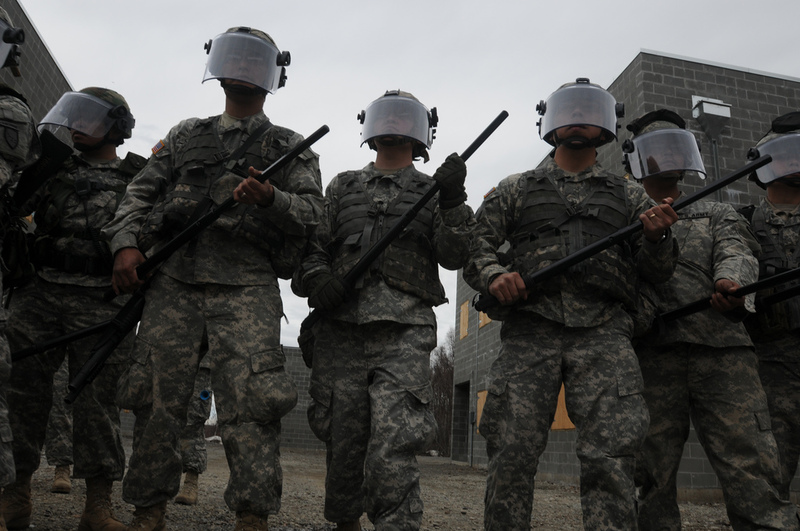 [PHOTO: Click on photo for explanation of USNORTHCOM training 2010 as Alaska Army National Guard Soldiers assist Anchorage Police to calm or detain rioters as part of the training scenario. 2. For those of you who have no knowledge of any of this, the documentation is enough to fill a large library. I’m giving you places to check and verify. George W. Bush tried to finish a North American perimeter around the continent by 2010 through a number of amnesty bills, from 2005 to 2007 but failed. Each amnesty bill had wording for building a North American perimeter. 3. Once North America becomes a regional entity, a North American Community with “shared sovereignty”, they will merge with the other 31 nations of the Americas. These three nations have already committed to membership in the Pathways to Prosperity in the Americas, making 14 nations so far. RICHARD N. HAASS, President of the Council on Foreign Relations, is the force behind building a North American Community, with a common outer perimeter and open interior borders, allowing for the free flow of people and commerce throughout the continent. All citizens of North America can then “live and work” anywhere. President Obama has not asked Congress for permission. It will be a fait accompli. An unannounced revolution. Haass directed the plan for building a North American Community, a 32 page document that, when completed, will, in fact, have passed the point of no return. And as citizens of North America they will no longer have to show their ID anywhere on the continent. Along with the Mexican movement to take political power in large areas of America and the widely-known population decrease of white Americans, the United States will no longer exist, de facto, by 2050. Check out this article. In here, even the previous Pope put in his bid to rule the world. Haass is a frequent guest on Morning Joe, MSNBC. For those of you who don’t know, the overwhelming number of new inhabitants may choose not to become a U.S. citizen, others will choose to have dual citizenship. The Mexican government has already set that up. Mexicans can become dual citizens. 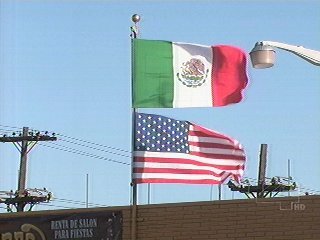 Some Mexicans now living in the United States already have that status and have voted in both countries and run for office in both countries. Across America there are areas (Miami in southwest Florida, the western United States and other areas in the north) where Spanish is the language spoken. If you live in these areas, you will likely find out that if you can only speak English, you will not be able to find a job. And you may not get a job anyway because of the hatred of white Americans by native Indians that is 500 years old. Spanish-speaking people who are born here or arrive here in the U.S. understand, especially the Mexicans, that the white population is dying out while the Latinos, Hispanics, and mostly new Spanish-speaking people, are being added to our nation. They will speak Spanish to a diminishing white population. “America has one national creed but many accents. We are now one of the largest Spanish-speaking nations in the world. We’re a major source of Latin music, journalism, and culture. Just go to Miami, or San Antonio, Los Angeles, Chicago, or West New York, New Jersey…and close your eyes and listen. You could just as easily be in Santo Domingo or Santiago, or San Miguel de Allende. For years our nation has debated this change – some have praised it and others have resented it. By nominating me, my party has made a choice to welcome the new America.“ George W. Bush, 2000. The Mexicans and Mexican-Americans living in America now know that they are going to take over. Mexicans educate their children to what they call the Reconquista. Another motto heard in the Latino community is that this nation is now their “Manifest Destiny” and they look with derision on the white citizens living among them.Violence is common at all levels in the west, in particular California. White American families meeting Mexicans going to the store or happening to be in a prominent Latino section, can find themselves in a verbal, even physical fight with Mexicans. 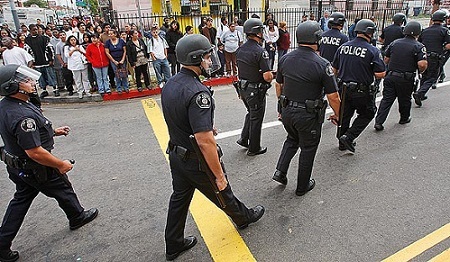 Riot squads in Los Angeles often respond to violence in large numbers at schools. The violence is Mexicans attacking Blacks and Mexicans attacking Whites. These riots and violence are captured on local TV stations but never passed up to the national news. CNN, MSNBC, even FOX won’t cover these stories. I urge you to seek these local stories on GOOGLE since this will be the future in a police state. Those of you living in these areas understand this. Watch this video for a sample of what the future of America will be like. (PHOTO: Los Angeles riot team seeks to restore order in a local high school. In the future USNORTHCOM will be on call for an integrated North American trilateral military/police force to maintain order in an integrated continent. Yes. This is the New World Order that George H.W. Bush and Henry Kissinger have praised all these years. Now consider that more Americans have been killed by Mexicans and other Latinos over the last ten years than have died in all our wars in that period. Here are some of the continuing deaths caused by Latinos, some of these criminals even escaping justice by courtesy of Homeland Security, local police, and sanctuary cities across America. 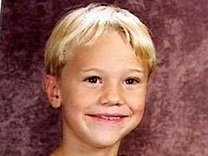 In 2007, Jordin Paulder was playing in his Atlanta yard when an Illegal alien driving by, stopped, got out and twice embedded an axe in young Paulder’s face. He died in the hospital. The illegal alien from Honduras was later killed by police in a confrontation. Read the whole story in the link above and consider that more Americans continue to be slaughtered daily by illegals. The killing goes on while America’s CEOs push to have Mexicans replace Americans as workers. These tens of thousands of Americans continue to die so that corporate leaders can amass billions of dollars. Their deaths mean nothing to them. Bill Clinton, George W. Bush and now President Obama, have been participants for the first time ever as leaders of a nation, at the behest of American CEOS such as Whirlpool, Wal-Mart, Ford and others, have decided to commit ethnic cleansing on their own people, mostly the white race. Think about it. That’s why Obama said Americans, (mostly white), will need to learn Spanish in the future. The future of America will be governed mostly by Spanish-speaking people at all levels. And be assured that whites (and black Americans) will be the odd persons out when jobs are available. Many jobs will be given to cheap workers from throughout the Americas as part of this New World Order, in which the few will govern a world where every person will be accounted for. All taking place on a dying planet. With all citizens free to live and work anywhere, many of those Mexican auto workers who earn $4.00 an hour, including .50 in benefits, can match the pay of Chinese workers. And yes, many workers will move to America and make our wages drop. That is the goal for corporate CEOs in America. Many of you will become an unemployed American. And the next president elected, republican or democrat, will continue to destroy our nation and our people. If you care about your family, your country, your job, you had better start a plan soon. *Candidate Obama told an audience that he knew nothing about building a North American Union, (or Community). He was awkward in denying that he knew anything about it. He lied. 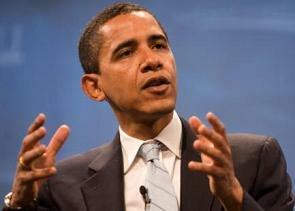 Obama was fully informed by the Council on Foreign Relations about the North American Community. He also was informed about it from CEOs and briefed more from George W. Bush. His whole campaign was nothing but lies to his supporters. All of you who voted for the two major candidates wasted your vote. The same will happen at the next election. Go to this site. Then scroll down to the first video.